So it is Tuesday, and what you see here is... not a regular TWD blog entry. I was really prepared to do the Tourtely Apple Tart, chosen by Jeanette of The Whimsical Cupcake. 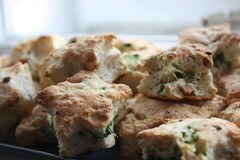 You can find the recipe on her page or on pages 306 and 307 in Dorie's book. I buyed the apples, and had everything else already at home. I was really looking forward to it. It is still Lenten Season. One more week to go without sugar, alcohol or meat. I already had to skip the Coffee Icecream Tart and the Strawberry Rhubarb Double Crisp this month, which I both regret a lot. I thought I could handle baking an apple tart without tasting. But in the very last minute it was evident for me: No way. I won't resist. I just can't bake something without tasting the result and the dough in the making. I am sorry. But I will catch up with as much as possible. That's how it did work last year, and that's what I am going to do this year. I don't want to break my Lenten promise. Not one week before it is over anyway. So, this week again I had to choose another recipe, one that is do-able without sugar. Mostly this is true for some muffins, some scones and almost all biscuits. 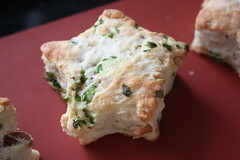 I already had a look at this recipe very often because I like nuts, I love sour cream and I adore biscuits. 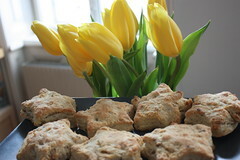 The Pecan Sour Cream Biscuits were originally due long, long time agoe on February 26, 2008. You can find the recipe in Dorie's book on page 25.